^ 1.0 1.1 Long March 5 Will Have World's Second Largest Carrying Capacity. Space Daily. 2009-03-04 [2012-09-04]. ^ Space.com staff. China Tests Powerful Rocket Engine for New Booster. Space.com. 30 July 2012. The more capable Long March 5 rocket is expected to help the country achieve its goal of constructing a space station in orbit by the year 2020, as well as play a key role in China's future space exploration aims beyond low-Earth orbit. The rocket's maiden launch is expected to occur in 2014. ^ 长征五号火箭. AirForceWorld.com. 2016-06-12 [2016-07-01]. ^ 4.0 4.1 长五首飞成功！中国“奔月”“探火”靠它了-新华网. news.xinhuanet.com. [2016-11-16]. ^ 长五运载火箭计划11月上旬发射 将承担空间站等重大发射任务-搜狐. mt.sohu.com. [2016-11-16]. ^ 陈钢. 我国新一代大推力火箭发动机“极限工况热试车”成功. 新华网. 2012-07-29 [2014-12-08]. （原始内容存档于2012-08-01） （中文）. ^ 万淑艳. 长征五号火箭拟于2015年上半年首飞 搭载试验卫星. 中国新闻网. 2014-03-05 [2014-04-07] （中文）. ^ Bradley Perrett. 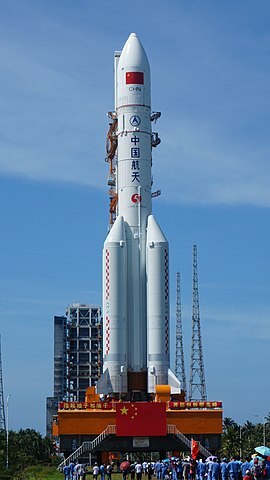 China's Long March 5 Will Not Launch Until 2015: Another delay besets the heavy launcher on which China's space program is betting. Aviation Week & Space Technology. 2013-05-25 [2014-12-08] （英语）. In 2007, the Long March 5 was due to make its first flight in 2013. A year ago, the target had slipped to 2014. China Daily now says the first flight will "probably" occur in 2015. ^ 陈炜伟、许祖华. “长征5号”火箭2014年首飞　将为中国空间站建设提供运力保障. 新华网. 2012-03-05 [2014-12-08]. （原始内容存档于2014-12-17） （中文）. ^ 人民网-科技频道. 长征五号火箭圆满完成芯一级动力系统第二次试车. 人民网-科技频道. 2015-03-23 [2015-03-25] （中文）. ^ 天宫二号”总设计师：不再有天宫三号 五年后直接建成空间站. 新京报-戴玉玺. 2017-11-22 （中文（简体）‎）. ^ 17.0 17.1 Lsquirrel. 长征五号首发，中国跻身航天强国. 果壳网. 2016-11-03 [2017-06-27]. ^ 白国龙、任珂. 中国成功发射实践十七号卫星. 新华社. 2016-11-03 （中文）. ^ 新华社快讯. 长征五号遥二火箭发射失利. 新华社. 2017-07-02 （中文）.